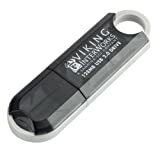 Viking USB00128L 128 MB USB Storage Device. $6.99 after $10 rebate. Viking 128 MB CompactFlash Card (CF128M) $2.99 After Rebate. Amazon has the Viking 128 MB CompactFlash Card (CF128M) selling for $18.99 with a $16 rebate (exp. 12/31/04) making your cost $2.99. Free shipping on orders of $25 or more and no taxes for most. Viking 128mb CompactFlash Card - $1.99!